— This article by Jerry Cates, Zac Morgan, Leanne Wiles, Shelly T., and Robert B., first published on 9 August 2010, was last revised on 23 October 2012. © Bugsinthenews Vol. 11:08(04). Imagine that you, like Zac Morgan and his girlfriend, Leanne Wiles, are enjoying a warm afternoon hike along a creek near the city of Bee Cave, Texas. Bee Cave, in case you don’t know, is a fast-growing city of some 2000 souls located in western Travis County, on the outskirts of the much larger city of Austin — the Capital City of Texas. It is late July, and the water is inviting. You stop on the bank and survey the idyllic scene. 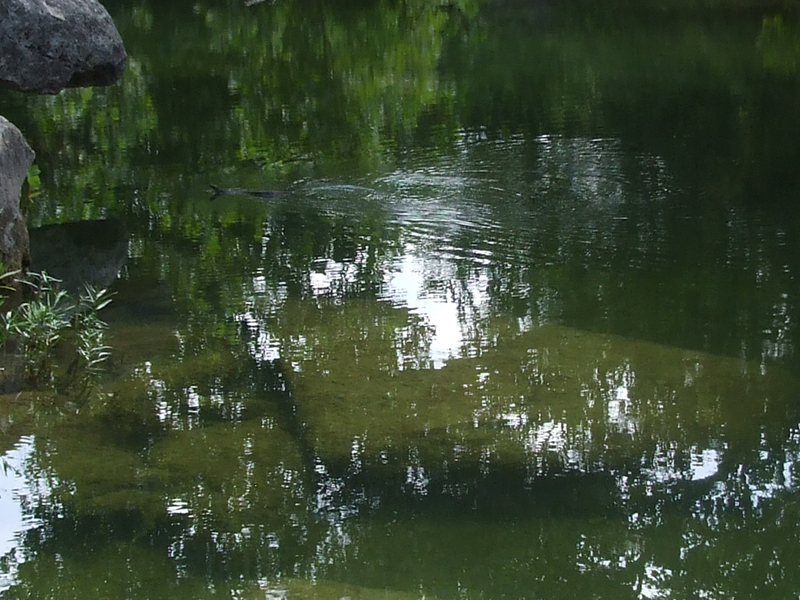 In the distance, ripples spread out from something disturbing the creek’s otherwise glassy surface. You look closer. A snake, swimming in the languid stream, is clearly the source of the disturbance. Its body glides along the water’s surface, halfway submerged along its length, half above the water line. “What kind of snake is it?” you wonder. But how can you possibly make a good guess about its identity, this far away? That’s a good question, provided there is a good answer to go with it. And, it happens, there is. A good answer, that is. 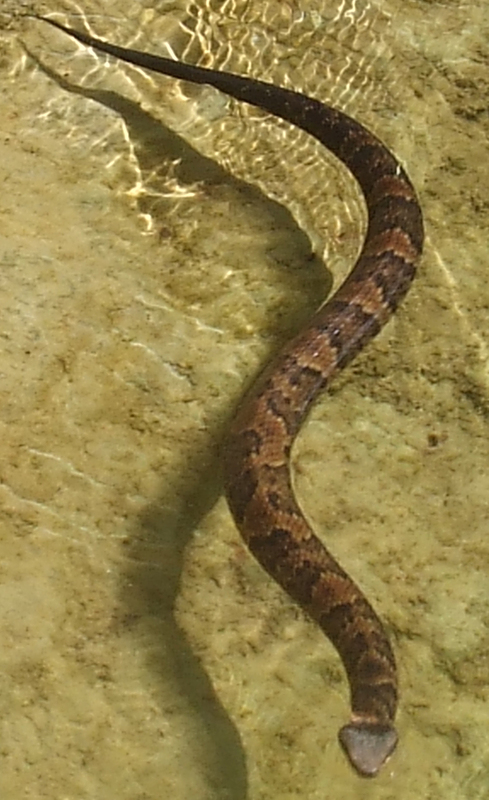 Most of the snakes we see swimming in Texas waterways are harmless water snakes in the genus Nerodia. They can be mildly, even severely annoying, at times. But they are not dangerous. When we see them swimming in our lakes and streams, the first thing–sometimes the only thing–we see is the head, attached to a slender neck. The body of a nerodian water snake is submerged almost entirely under the water, because their functional lung has only a diminutive air sac, positioned near the anterior portion of the body, which is not large enough to keep them afloat. That’s good for them, because although they usually travel with their head out of the water, and sometimes forage on the water surface, they prefer foraging in deep water, diving often quite deep under the water, even to the bottom, where their favorite fish are most abundant. By that measure, though, this snake that Zac and his girlfriend are seeing is not a harmless water snake in the genus Nerodia. That slender bit of “trivia,” all by itself, might not be particularly helpful. Lots of other snakes love to swim in the water. Texas rat snakes, for example, tend to swim once or twice a day in captivity, if given a bowl of water to immerse themselves in. But it so happens that these and almost all our other snakes are just like the nerodian water snakes. Their diminutive, anterior air sacs help keep their heads out of the water, but they are too small to allow their bodies to float. There is, however, one major exception to that rule. The cottonmouth (Agkistrodon piscivorous), a dangerous pit viper capable of delivering a painful, debilitating, even fatal bite, has an unusually large air sac that extends practically all the way from its anterior to its vent. This air sac allows it to float so well that, when it swims, about half its body, along its entire length, remains above the water line. Note: Some of our local Texas herpetological authorities claim that the western cottonmouth is never found in Travis County, Texas, and others even go so far as to say it is not found anywhere within the Highland Lakes area (in the Hill Country of central Texas, starting about 85 miles northwest of Austin and going all the way into Austin). Obviously, as Zac and Leanne’s encounter indicates, that assertion is untrue, though it is true that sightings of cottonmouths in Travis County and the remaining Highland Lakes area are relatively rare compared to sightings of harmless nerodian water snakes (with which the cottonmouth is routinely confused). The range of the western cottonmouth in Texas once extended all the way to the Rio Grande, but now is confined to central and eastern Texas, including the Colorado River and its watersheds, and along the Gulf Coast from a point south of Corpus Christi and thence eastward. Perhaps “allow” is the wrong word. In point of fact, the buoyancy of this snake’s body inhibits its ability to dive under the water. Not that it matters. Studies show that the cottonmouth prefers to forage in shallow water, particularly along the shoreline. And, when it goes into the water, it floats lazily from one location to another. According to Alan H. Savitzsky, in a study he published in 1992, the cottonmouth does not venture into the water, but onto it. Now, that phrase may not always work. It is possible some other snakes tend to float on the water when they swim. In fact, I’d be surprised if that were not so. And the cottonmouth can also sink under the water if necessary, though it takes a lot of effort for it to do so. However, it is a fact that the cottonmouth is very well known for floating on the surface of the water, while most other snakes sink. So–if you see a snake with its entire body floating on the water, rather than submerged under the surface with just its head sticking out–you can be forgiven for automatically presuming it to be a cottonmouth. Beyond that, of course, it would be good to also know some of the other features that distinguish the cottonmouth from other snakes. After all, the cottonmouth is considered a semi-aquatic serpent. It does not spend that much of its time on the water. When you meet one in the wild, chances are you will meet it on land. A closeup of the snake that Zac and his girlfriend saw in the creek at Bee Cave is shown at left. By the way, if you place your cursor over any of the photos posted on bugsinthenews and click on them, an enlarged version of the photo will come up. That allows a closer look, especially of the detailed anatomical features we discuss. Note that this particular specimen has an unusually flat head. That is characteristic of all the cottonmouths, but isn’t typical of the rest of our North American serpents. The eyes bulge slightly beyond the face-line on each side, but not by much. Most snakes, including the Texas rat snake and the nerodian water snakes, show the eyes well when viewed from above. Now notice the markings on the serpent’s body. The darkened cross-bands, sharply edged on their peripheries with pale centers that may include a few darker spots, are characteristic of the cottonmouth. The cross-bands tend to narrow at the spine. In fact, that feature is behind the specific name of the cottonmouth’s closest cousin, the copperhead (Agkistrodon contortrix), which is derived–via a complicated, even tortuous route — from the Greek root κοντος (kontos) = short(ened) + the Latin word tortrix = twisted, in a highly unorthodox combination intended to mean “pinched.” The reference is to the fact that these markings tend to be “pinched” at the spine, that is they narrow at the spine and become broader on the sides towards the belly, like an hour-glass. It happens that the western cottonmouth exhibits similar markings, which isn’t that surprising considering they are closely related. See the tail? Looks rather long, thin, and stretched out, right? What does this tell you about the old saw that venomous snakes have blunt tails? I immediately wrote back that her e-mails are anything but a bother (she always sends me the best stuff). And, yes, this is a copperhead. My guess is a broad-banded copperhead (Agkistrodon contortrix laticinctus), though the distinctions between that subspecies and its cousin, the southern copperhead (A. contortrix contortrix), are not always as stark as the literature suggests. The southern copperhead has crossbands that are shaped like an hourglass, its waist at the spine, the bowls of the hourglass extending down the sides of the snake. The broad-banded copperhead has crossbands that may show a slight narrowing at the spine, but are otherwise about the same width down the sides of the body, like this one. See the similarities between this and the cottonmouth above it? The markings of the copperhead provide excellent camouflage in the woods and grassy meadows where it spends most of its time. That helps explain why many copperhead bites are recorded in Texas every year. If you see it, you probably (?) would not step on it. 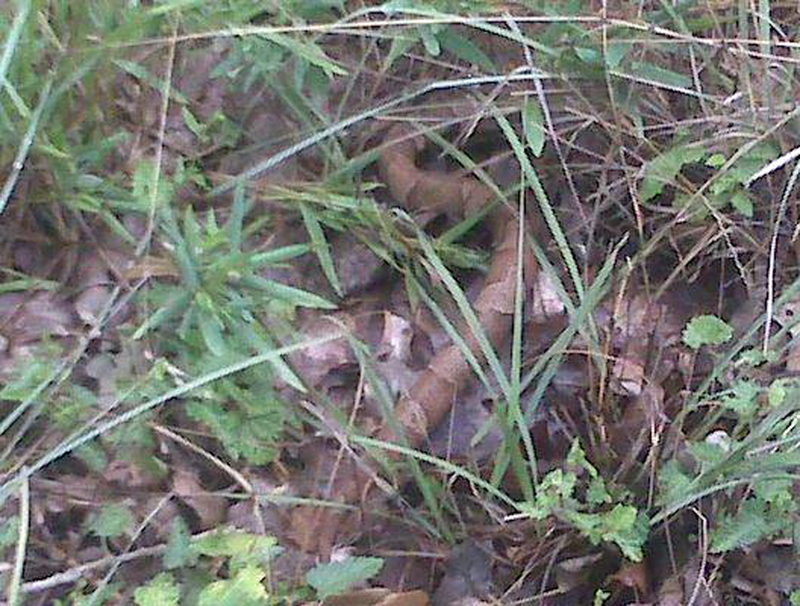 But this snake, when partially hidden in the grass, often looks more like a tree root than a snake. 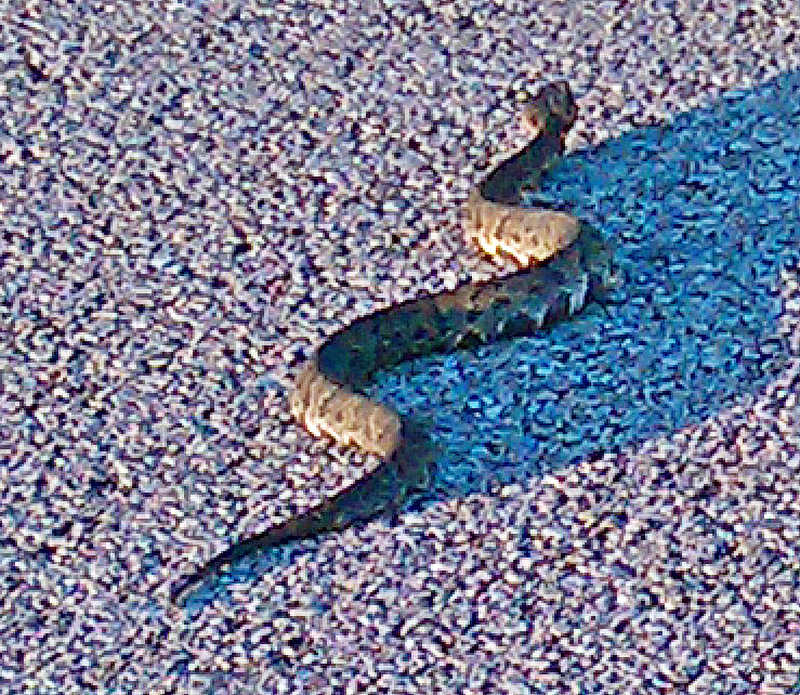 I saw the snake in the attached picture sunning itself on a road in Jack Brooks park, in Hitchcock, TX. There were very few people or cars around yesterday. I’ve tried to identify it from sites on the Web, but without success. Those large dark patches on the bottom of its sides don’t seem to match any pictures I’ve seen. 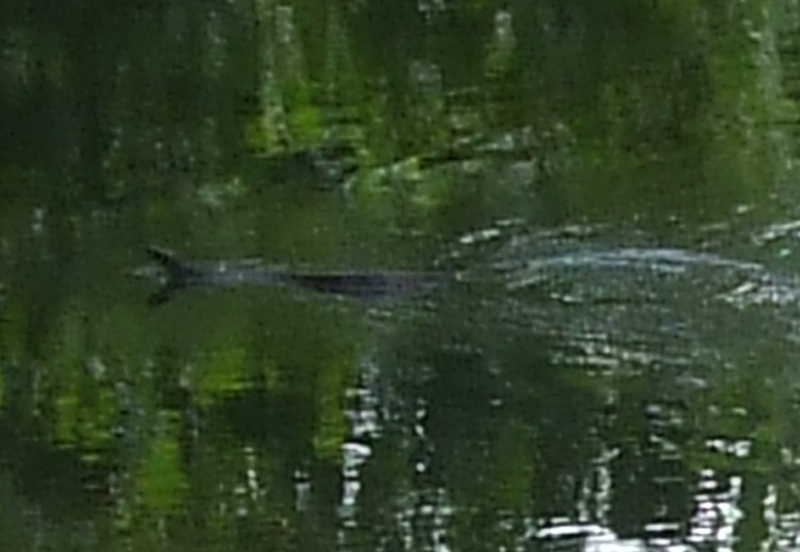 There is a pond near where we saw it, so I’m guessing some sort of water snake. Notes: I couldn’t get close enough to see its eyes–it headed off into the grass when I stopped the car–but I’m pretty sure it didn’t have a rattle. It was roughly 2 feet long. My daughter and I would be very curious to know any ideas you have about it! I wrote Robert back that this was a western cottonmouth. The black markings on the belly (notice the vertical lines in the yellowish portions between the black marks; those are the interstices of the belly scales; the black marks are actually on the snake’s belly) are one other important characteristic that distinguishes the cottonmouth from most other snakes. It is rare for any of our other snakes native to North America to have such dark black markings on the belly, but the fact that these marks distinguish the cottonmouth is etched in one of the common names given to it: “Water moccasin.” The Algonquin Indians gave it that common name because the belly scales, extending up the snake’s sides, with the dark bars that marked the belly, resembled the moccasins they crafted for themselves out of deerskin and tar, the latter for improved traction while climbing on rocks and tree trunks. Now notice the crossbands on the upper body. They are hour-glass shaped, as we would expect of a snake in the genus Agkistrodon. The large, extremely flat head is another feature that characterizes the cottonmouths. Ok, that’s a copperhead, right? Do you see him in the center of the picture?!! I’m very excited to have seen him. We had moved him away onto Corps property, safety! I won’t bother you anymore this summer!! Thank you so much for your time, patience and knowledge.